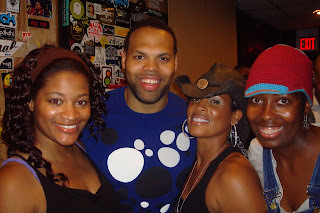 Eric Roberson (ERRO) taking the time out to show us love. Afterwards, I rocked out to the beats by DJ Anthony Valadez. Can I just say, DJ Anthony Valadez is the 2nd hottest DJ I've ever rocked out with; D-Nice is my top! Anthony Valadez, whom I've never heard of is for sure a very, very, very, very close 2nd. I can't believe the workout he gave me. I need him in my dance expression life, and you should get him in yours too. Here's a list of songs he played: Oh Sheila!, Push It (Salt N Pepa), Supersonic (JJ Fad), It Feels Good, (Tony, Toni, Tone), People Everyday (Arrested Development), Cool It Now (New Edition) I Like (Guy- to which Danna and Zenja started the electric slide),Gotta Give It Up (Marvin Gaye), Kissing Game (Hi Five), and then he brought us up to the millenium with hot songs by Estelle, Donell Jones, Ciara, Lloyd, and Omarian.